Our year of changes continues with the departure of Leslie Pont from the Treasurer’s position at the end of this season. Sincere thanks to Leslie for her service on the MPRO Board these last five years, for her thoroughness and calm efficiency, for always having the financials updated and the figures at hand. Her work on the recent Leenhouts workshop in particular was exemplary, and was a great help in its planning. LouAnn Hofmann has graciously volunteered to assume the Treasurer’s position and has already begun transitional activities with Leslie. Many thanks to LouAnn for assuming this vital role for the orchestra. With the recent availability of the Board job descriptions to the membership, I’m hopeful we’ll have similarly smooth transitions in the future when these vacancies occur. It’s been my experience that people more readily pursue these types of responsibilities when they understand them in detail. Finally, with our Spring Concert only a month away, we’re all working on our music. As challenging as some of the pieces are, I’m finding that focusing on their more interpretive aspects helps reduce the tension around getting the notes right. Even the trickier passages can become easier that way. Listed below is information regarding the final meeting, dress rehearsal and performance that will conclude MPRO’s 2013-2014 season. Bassoon, bass viola da gamba and contrabass recorder will be needed at the meeting on May 14. These instruments plus krummhorns, dulcien, sopranino and great bass recorders will be needed for the dress rehearsal on May 30 and concert on May 31. Please note that the meeting on Wednesday, May 14, will take place at Trinity Presbyterian Church, 1106 Alameda de las Pulgas in San Carlos at 7:30 P.M. and that Friday, May 30, is the dress rehearsal for MPRO’s spring concert, and this rehearsal will also take place at Trinity Presbyterian Church at 7:30 P.M. The spring concert will be at Trinity Presbyterian Church on Saturday, May 31, at 4:30 P.M. As in the past, small ensembles are encouraged to appear in the spring concert. Those groups that intend to perform at the spring concert on May 31 are asked to send me the following information by May 16: the title(s) of the music to be performed, the name(s) of the composer(s), the name of the ensemble (if any) and the names of the ensemble's members. The orchestra’s spring concert will offer a wide variety of exciting and attractive music for recorders and other instruments that spans over five hundred years, and I encourage you to invite your family and friends to attend this performance. I would also like to thank the members of MPRO for all of the time and effort that they have put in preparing this season’s music, as well as the orchestra's officers for seeing to the necessary tasks that make MPRO's programs possible. Special thanks go to Greta Haug-Hryciw for assuming the position of the orchestra’s Assistant Director and conducting a portion of this season’s spring concert. I wish all MPRO members the very best this summer and look forward to seeing all of you again in September at our first meeting of the orchestra’s 2014-2015 season. Workshop assistant and teacher Greta Haug-Hryciw is frequently a guest conductor for several chapters of the American Recorder Society. 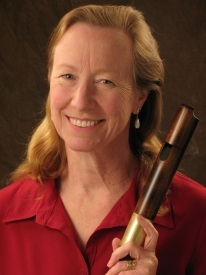 She co-directed the American Recorder Orchestra of the West (AROW) with Richard Geisler from 2005-2010 and is currently co-director of the Barbary Coast Recorder Orchestra (BCRO) with Frances Feldon, for which she also orchestrates repertoire. She is the founder of the recorder ensemble SDQ and also performs with the Peralta Consort, Ensemble Trecento, Gryphons Wild and the contemporary ensemble Uncorked. She teaches recorder to students of all ages, produces concerts and arranges music for small ensembles and recorder orchestra. Although she considers herself primarily a recorder player, she also enjoys singing, playing percussion and occasional didgeridoo accompaniment. In October of 2013 she began assisting MPRO member Bill Lazar at his Early Music Shop in Mountain View. Greta is honored to be asked to take on the assistant directorship of MPRO and hopes that her contribution and style will be pleasing and beneficial to the orchestra. Greta and her husband, Lloyd, live in Montara on the San Mateo coast. Upbeat will begin its traditional three-month summer break following the publication of this issue. Noteworthy accomplishments during MPRO’s 51st season include the Holiday Concert, the upcoming Spring Concert, and the January workshop with Paul Leenhouts. MPRO also selected several new board members, created the position of Assistant Music Director and appointed Greta Haug-Hryciw, and welcomed several new members and guests. Many thanks to Music Director Fred for creatively and meticulously arranging music for the orchestra, as well as to George Greenwood for compiling the music and making it available in print and midi form. Production of Upbeat will resume with the September 2014 issue. Best wishes for an enjoyable summer.